The world wide web is 20 years old. Sir Tim Berners-Lee had a talk at TED about the birth and the future of the web. He was talking about the Semantic Web without saying these words. He called it linked data. This could be the first step towards..
By the way! The lead of the Semantic Web Activity group is Ivan Herman who was born in Budapest, Hungary. An other great brain who makes an impact after leaving his country. I got this video by e-mail. I have watched it minimum ten times. Can not write anything about it. Az oldalon látható kalkulátor segítségével a 2008-as szabályok alapján kiszámítható a motorkerékpárok regisztrációs adójának mértéke. Ki kell tölteni a motorkerékpár hengerűrtartalmát, z első forgalomba helyezés dátumát, valamint a regisztrációs folyamat kezdésének dátumát. Ekkor a kalkulátor automatikusan kalkulálja a fizetendő díjat. A kalkuláció tájékoztató jellegű, a számítás eredménye nem hivatalos, ezért nem lehet alapja semmilyen hivatalos dokumentumnak. Két héttel ezelőtt repülős napot tartottam. Kétszer voltam repülni. Egyszer az oktatómmal, Kócossal, utána pedig Csabival. Sounds like a good deal, right? All you have to do is get Firefox 3 during Download Day to help set the record for most software downloads in 24 hours - it’s that easy. Just started to make a concept about the development of intranet site at our company. Since the current site based on a very closed cms system, we have the opportunity to think it over from the foundation. I have spent plenty of time to read case studies and articles in the topic. I must say, that companies think different about their intranet and the intranet as a tool of communication. The possibilities are usually restricted by data security issues. It is really interesting when you have companies talking about innovation while having strict policies inhouse. How can they be innovative or how much potential do they got when the employees do not have the opportunity or restricted to share their knowledge. I have found an interesting post about the policy at Google. "All information is shared with everyone." It is common and normal for people are working at small development companies. Employees have the common goals to achieve and they work for the same goal. How can we reach this goal easier? If we do not reinvent the wheel every day. We use the knowledge and experience others gained during their work. It is so easy. I think strict policies "growing" at companies where there are tensions between departments and employees. The ones got the information can have some advantage over others. The company becomes ineffective. The focus became wider. They will have disadvantage in the competition. Of course there are markets where there is no real competition (like banking in Hungary). Who will get the last big stakes before the fast growing slows down? I think the companies who will have the focus. Is it possible that a simple, and from the business point of view, not so important area can effect the success of a company? Finally I got it! 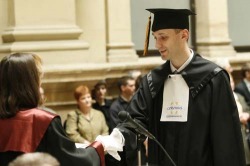 I have graduated my second diploma at Corvinus University Budapest. Officially I become an economist. I don't want to write too much about it, check this image out. Unfortunately we did not have a speech like the ones at Stanford in 2005. There Steve Jobs had his talk, which became a historical speech. Please listen to it below. It is 15 minutes, but you will like it.. I have found a very interesting video on youtube. It is about the current trend in the corporate intranet, the introduction of web 2.0 thinking. How will IT and communication people convince the management about the need of change? Good question. I think, step by step.. Old managers go, new come. The talk is full of todays buzz-words: rss, wiki, blog or podcast. It is very interesting that which industries are heading this way: banking and health care. They need fast communication and fast data or knowledge exchange. And not least they are working with high security information! Watch the video, it is interesting. I had the fortune to attend the third web 2.0 conference in Budapest, the web 2.3 symposium. This is my first conference in this topic in Hungary for years. I was very disappointed. Now I understand the behavior of big Hungarian companies (sometimes with foreign owners but with Hungarian management and employees). I understand why employees are trying to ban innovation. They are afraid from any new idea or technologies. There are three big companies ruling the Internet world in the country. They split these 3.5 million Internet users. Yes, it is a very small number, and there is a barrier of the language we can not do anything with. These companies brought every useful web 2.0 companies like social networking and blog sites. Around 95% of users are tight to these services which are very closed. They are afraid to lose users so they trying to block the moving of users by banning export functions. While in the world everybody is talking about openid, FOAF, google social graph api, there was any words about these at this conference. They want to close every door? Can anybody tell me why? The event was sponsored by this monopolies. They had around 50% of presentations, other 30% were presented by other sponsors. The remaining talks were held with bloggers, and new startups. After every presentation the attendance had the opportunity for questions. No one asked asked anything. It was very furious for me. People don't care about it? Don't know. I am afraid that they don't need it. It it is true, I am very sad about the future. How can we be competitive? If we have a donkey, how can we do the same work as our neighbours having a John Deere? The real sad thing is that we have the same mentality at market leader companies also. Imagine a company where you have to work without instant messaging, wiki nor social networking with any kind of collaboration? Have you ever worked like that? Yes, ten years ago! Piper PA-28-140 Cherokee Owner's Manual is available to download here.